CONVERSABLE ECONOMIST: A Third Kind of Unemployment? Economists typically think of unemployment as falling into two categories. 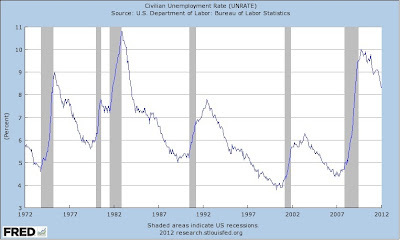 There is "cyclical" unemployment, which is the unemployment that occurs because of a recession. And there is "structural" unemployment--sometimes called the "natural rate of unemployment" or the NAIRU for "nonaccelerating inflation rate of unemployment." This is the rate of unemployment that would arise in a dynamic labor market even if there was no recession, as firms expand and contract and people move between jobs. The level of structural unemployment will be influenced by factors that influence the incentives of people to seek out jobs (like the costs of mobility between jobs and the structure of unemployment, welfare, and disability benefits) and the incentives of businesses to hire (including rules affecting the costs of business expansion, rules affecting what firms must provide to employees, and even rule affecting the costs of firing employees, if necessary, later on). Inconveniently, the unemployment that the United States is currently experiencing doesn't fit neatly into either of the two conventional categories. After all, the recession officially ended in June 2009, according to the Business Cycle Dating Committee of the National Bureau of Economic Research. However, the unemployment rate has been above 8% since February 2009, and in a February 2012 report on "Understanding and Responding to Persistently High Unemployment," the Congressional Budget Office is forecasting that it will remain above 8% until 2014. In a conventional economic framework, it's not clear how to make sense "cyclical" unemployment that persists for four or five years after the recession is over. However, the CBO and other forecaster have been predicting all along that the unemployment rate will eventually drop as the aftereffects of the Great Recession wear off, and in that sense it doesn't seem like natural or structural unemployment, either. It's not clear what to call this persistent jobless recovery unemployment. 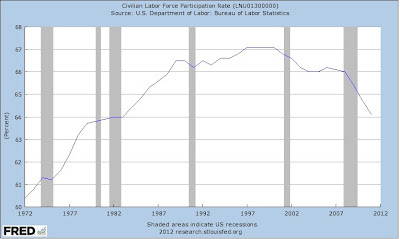 "Lethargic" unemployment? 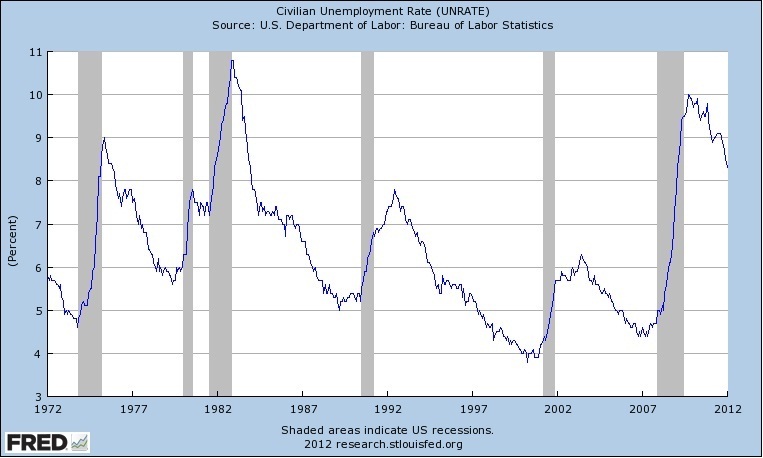 "Sluggish" unemployment? "Torpid" unemployment? "Tar-pit" unemployment? However you label it, this this is now the third consecutive "jobless recovery," where it has taken a substantial time after the end of the recession for unemployment rates to come back down. It used to be that unemployment rates peaked almost right at the end of the recession, and the steadily dropped. Here's a graph of unemployment rates from the ever-useful FRED website of the St. Louis Fed. Periods of recession are shaded. For example, when the 1974-75 recession ended in March 1975, unemployment was 8.6%. It climbed just a bit higher, to 9% in May 1975, but then fell steadily and by May 1978 was at 5.9%. Or look at the aftermath of the "back-to-back" recessions of 1980-81 and 1982. When the recession ended in November 1982, the unemployment rate was also peaking at 10.8%. It then dropped steadily and was down to 7.2% by November 1984 and 5.9% by September 1987. In the jobless recoveries since then, the pattern has been different. When the 1990-91 recession ended in March 1991, the unemployment rate was 6.8%. But the unemployment rate kept rising, peaking more than a year later at 7.8% in June 1992. it wasn't until August 1993, more than two years after the economy had resumed growing, that unemployment rates had fallen back to the 6.8% rate that prevailed at the official end of the recession. A similar pattern arose after the 2001 recession. At the end of that recession in November 2001, the unemployment rate was 5.5%. But then the unemployment rate kept rising, peaking out at 6.3% in June 2003. It wasn't until July 2004 that unemployment rates declined back to the 5.5% that had prevailed at the end of the 2001 recession. In the most recent recession, unemployment was at 9.5% in June 2009, when the Great Recession officially ended. The official unemployment rate peaked at 10% in October 2009, and has drifted down since then. But in this recovery, the unemployment rate is an underestimate of labor market woes, because the official unemployment rate only counts those who are "in the labor force," meaning that they are out of work but looking for a job. Those who have given up looking, or who are working part-time but would like full-time work, aren't counted as unemployed. The last few years have seen a dramatic drop in the "labor force participation rate," that is, the share of adults who are "in the labor force." This rate rose substantially from the 1970s through the 1990s as a greater share of women entered the (paid) labor force. But with job prospects so poor, it has been dropping off. for a job in the past four weeks as well as those who are working part-time but would prefer full-time work; if those people were counted among the unemployed, the unemployment rate in January 2012 would have been about 15 percent." Our public discussions of what to do about these persistently high rates of lethargic or torpic unemployment have been unfortunately locked into the two older categories of cyclical and structural unemployment. 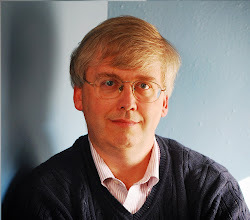 For example, some argue that if only the federal government had enacted an extra $1 trillion or so in fiscal stimulus, probably backed by a Federal Reserve willing to carry out another "quantitative easing" by printing money to finance the Treasury bonds for this stimulus, then the economy and the unemployment rate would be recovering much more quickly. But the federal government is in the process of running its four largest annual deficits since World War II from 2009 to 2012. The Fed is planning to hold the benchmark federal funds interest rate near zero percent for six years (! ), while also engaging in $2 trillion of quantitative easing. The amount of countercyclical macroeconomic policy has been massive, and I have a hard time believing that just another boost would have fixed everything. While I in general supported the countercyclical macroeconomic policies taken during the Great Recession (with some reservations about the details), it seems to me that countercyclical macroeconomic policy is like taking aspirin when you have a bad case of flu--or if you prefer a more extreme metaphor when talking about an unemployment rate that may exceed 8% for 7-8 years, like an athlete taking a cortisone shot for an injury before playing in the big game. Such steps can be worth taking, and they can sometimes even modestly help the healing process, but they are palliative, not curative. Also, the CBO offers a reminder that while more fiscal stimulus could help the economy in the short-term, it will injure the economy over the long run unless it is counterbalanced by a way of holding down government debt over time. "Despite the near-term economic benefits, such actions would add to the already large projected budget deficits that would exist under current policies, either immediately or over time. Unless other actions were taken to reverse the accumulation of government debt, the nation’s output and people’s income would ultimately be lower than they otherwise would have been. To boost the economy in the near term while seeking to achieve long-term fiscal sustainability, a combination of policies would be required: changes in taxes and spending that would increase the deficit now but reduce it later in the decade." But the standard policy agenda for dealing with structural unemployment doesn't seem particularly on-point just now, either. Sure, it would be useful to encourage mobility between jobs and to rethink how regulatory and other policies affect incentives to work and to hire. But while this kind of rethinking is always useful, it's not clear that it addresses the reality of high unemployment here and now. We need a convincing theory of this third kind of unemployment--sluggish unemployment, tar-pit unemployment--and an associated sense of what policies are useful for addressing it. Firms as a group have high profits and strong cash reserves, but they are not seeing it as worthwhile to raise hiring substantially, preferring instead to focus on getting more productivity from the existing workforce. Are there ways to reduce the costs and risks that firms face when thinking about hiring? Many households are struggling with outsized debt burdens, including those who have mortgages that are larger than the value of their home. Are there policy levers to help them move past their debt burdens? for work for more than six months—referred to as the long-term unemployed—topped 40 percent in December 2009 for the first time since 1948, when such data began to be collected; it has remained above that level ever since." 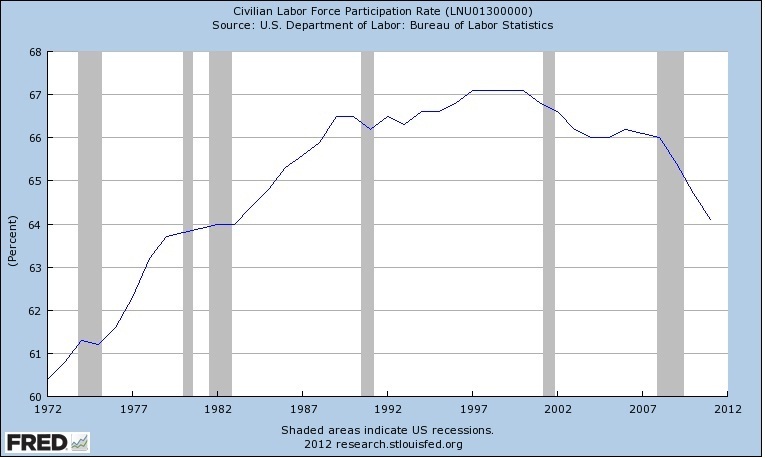 What do we know about getting the long-term unemployed back into the labor force? Are there ways to encourage greater mobility of people between jobs, perhaps by spreading more information about job opportunities, making it easier for employers to verify skills of potential employees, or encouraging both greater geographic mobility and mobility across sectors of the economy? Tolstoy famously started Anna Karenina with the comment: "All happy families are alike; each unhappy family is unhappy in its own way." Each unhappy recession is unhappy its own way, too--and the Great Recession is quite different from previous post-war U.S. recessions. It needs some fresh thinking about policies to address what has happened.